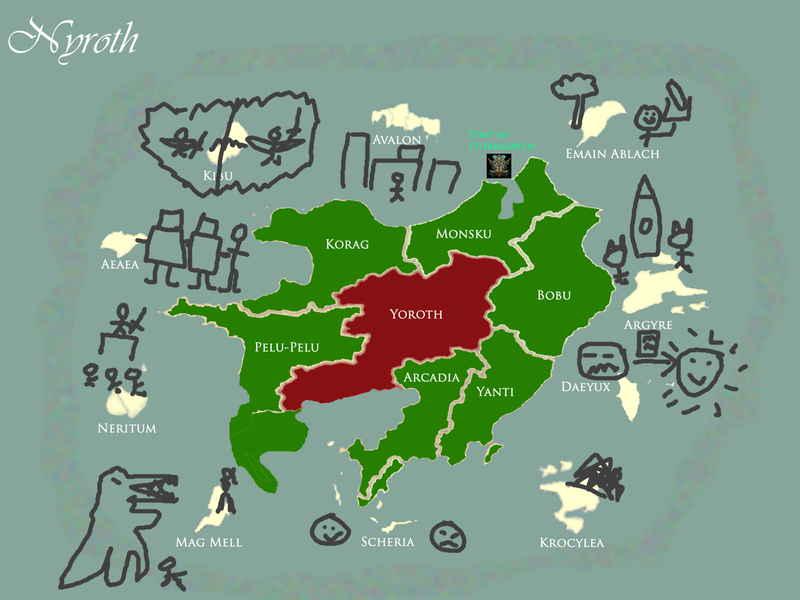 Home › Uncategorized › Nyroth Interactive Lore Event II Posted! Nyroth Interactive Lore Event II Posted! A map of Nyroth, annotated with illustrations by the nameless ancient Nyrothian discovered frozen in true ice just beyond the magical veil surrounding the continent. Little is known of him, other than that he appears essentially human and (whatever his role in that society may have been) he does not seem to have been an artist. I’ve just posted the second interactive lore event of the Nyroth arc. Now that they’ve landed on Nyroth at last, each faction has decisions to make. The primary purpose of this event is to get initial Research projects determined; the secondary purpose is to acknowledge Bilgewater’s impressive early performance by giving it some initial story wins. I’m going to be handing most of the World Systems operations over to Naggarok, and most of the lore organization to Montesque64 and the rest of the lore team. I will, of course, still be actively involved, but I’m trying to force myself to delegate more to our talented volunteers before I go bonkers from trying to do everything personally. Please be patient with them as they get acclimated.